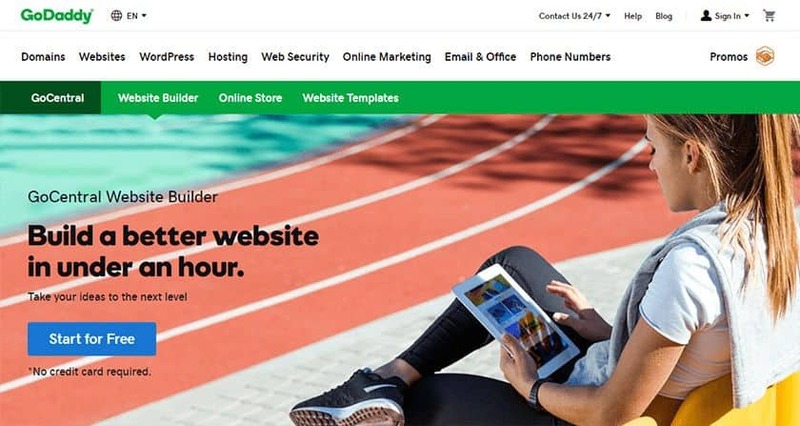 GoDaddy's GoCentral website builder offers a simple platform to create any type of website. It’s dynamically editable and boasts tools for standard and e-commerce websites alike. However, GoCentral is somewhat limited in template options, which is partially made up for by the fact that users can configure websites via mobile. GoDaddy is one of the top hosting websites globally, with over 18 million customers. It’s the largest domain registrar in the world, famous for clever commercials featuring celebrity spokespeople such as Danica Patrick. What some may not know is that GoDaddy has a separate website builder program known as GoCentral. 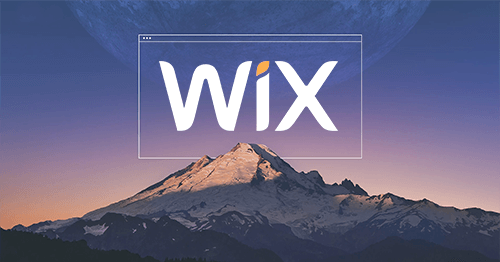 It offers dynamic editing along with a wide variety of pre-installed tools that will allow you to build any kind of website, whether personal or e-commerce. GoCentral’s ease of use comes with a price, however. The number of templates provided is less than that offered from other builders. However, it does offer you the ability to edit your website from mobile devices dynamically. Overall, the builder is very simple to use, allowing webmasters of all skill levels to build a fully functional website easily. Note that depending on what country you’re in, the term “GoCentral” may not be used to describe the website builder. Don’t worry, as it’s still the website builder mentioned in this review, just without the GoCentral name. GoCentral doesn’t offer much to the builder in terms of template designs. Once you tell the builder what type of website you want, it pulls together a group of design elements and presents you with 16 themes you can use to design your website. These themes are essentially minor variations of the same base template. The primary differences in themes are their font styles and color schemes. There are some very basic layout changes, but the changes are minor using the same layout blocks on each variation. The good news about these themes is that you can edit them dynamically, meaning you can change your website on the fly and see how it will look before you publish. Just click on the element you wish to change, and you’ll see which options are available for customization. In most cases, you can change the images of the themes using images from either the image library or your computer. You can also add a variety of elements to your webpages, including social media links, contact forms, and online store elements. Just click on Add to this page and select the element you wish to change. You’ll then be presented with options for items you can add. Themes also offer multiple multimedia options. You can embed your own audio or embed audio from SoundCloud. You can also post your own video or use videos from YouTube and Vimeo. Moreover, you can embed downloadable files and incorporate logos and badges into your website. One great thing about these templates is that they’re mobile-optimized for most devices due to their simple block design. Once you create your website, it will be ready for mobile. The primary downside to these themes is that they’re very simplistic. They incorporate a basic stacked-block design that makes your website look a bit plain. You’ll want to customize as many options as you can to improve its appearance, but your website is still going to have a basic look to it. GoCentral allows you to create a wide variety of websites, ranging from personal websites and blogs to robust business and e-commerce websites. The builder comes with all of the standard features you’d expect from a website builder, such as image and video galleries, contact forms, and the ability to add blog content. It also offers several value-added features that are not always available on standard website builders. If you’re looking to sell products online, GoCentral will give you the ability to do so without you having to become a coding genius. The website builder includes all the tools you need to build a store, including shopping cart software, inventory management, and more. You can accept a wide variety of payment methods using both Square and Stripe for back-end payment processing, along with PayPal and Apple Pay. With your online store, you can add from 1,500 to 5,000 products with up to ten images for each product. Your website allows for multiple shipping options for customers, along with shipping and tax calculation. You can even set up your website to send text notifications when your customers place orders. If you need a little help with SEO, then GoCentral is an excellent choice. SEO tools come standard with the website builder. The builder also automatically inserts tags and webpage titles to help boost your SEO. Also, GoCentral regularly monitors your website and automatically adds relevant and high-value keywords and phrases to help improve your rankings on Google, Bing, and Yahoo. If you have a business website, GoCentral will help you get onto Google My Business, allowing your business to show up in the business listings and Google Maps when someone searches for companies similar to yours, especially those in your general area. GoCentral’s website builder allows you to make dynamic changes to your website from anywhere and from any device. For example, if you decide to offer an unannounced sale on your store while traveling, you can set up the sale directly from your tablet or laptop. You can even make changes to your website directly from your smartphone. Best of all, due to dynamic editing, you can see how the changes will look directly from your device. One feature you don’t see on many website builders is free SSL certificates. With GoCentral, SSL certificates are built into your website automatically. No need to sign up and renew, and the website does this for you. SSL certificates are an important security feature that encrypts data from end to end whenever a customer visits your website. They’re required if you plan to operate an online store; so if you go with GoCentral, that’s one less worry. GoCentral is designed to give beginners a fast and easy way to create almost any kind of website from any computer or mobile device.The dynamic website builder incorporates point-and-click functionality in a simple menu-driven editor that helps you create website elements, fast. The builder starts by collecting a couple quick details about your website and then automatically picks a template and layout for you. Then you select from one of 16 themes that allow you to change all designs. You can use images provided by GoCentral or add your own to craft your perfect, unique look. The one downside to this builder is that the elements are block-style rather than genuinely dynamic. You arrange items with the block elements, but you can’t resize the block elements themselves. However, their templates are both responsive and dynamic, and whatever changes you make, you will be able to see how it looks on both desktop AND mobile. GoDaddy offers multiple support options for its various products. If you like to find their own answers, you have two choices. You can start by going to the Product Support webpage, which lists help sections by category. The GoCentral section offers a wealth of information, ranging from information on plans to the basics of using the website builder. It’s fairly comprehensive, with step-by-step instructions for each section. Next, you have the GoDaddy Community forums at your disposal. Like the Product Support page, GoCentral has its own forum category, with nearly 1,200 different topics available. You can search for an answer, or post a new thread and get help from contributors and other GoDaddy customers. If you want to speak with a person directly, you have multiple options for that as well. First, you can speak with GoDaddy through their 24/7 support line. If you’re not in the U.S., no problem! There are dozens of contact numbers available around the world for your convenience. In addition, they offer live chat support. Note that some agents may not be native English speakers, but for me, they were still more than helpful. With multi-lingual 24/7 live chat, phone support, and robust self-help tools, GoCentral has you covered for whatever problems may arise with your new website and hosting. Godaddy GoCentral has four plans, offering both monthly and annual billing. The Personal plan is the most basic, but if you want to sell products, you need to upgrade to Business or higher. All plans come with core features such as dynamic editing. Check out the chart below to see what features you get when upgrading to a bigger plan. Pay close attention to pricing, as it defaults to annual pricing. Monthly pricing is higher across the board. You can save up to 33% when you go with yearly pricing. Even with the “savings,” pricing is about average compared with similar website builders. You do get a free domain for your first year regardless of which plan you pick, and that’s something you don’t get with all website builders. You’ll also enjoy free SSL certificates, saving you even more money. GoCentral offers a 30-day free trial, but your website will be hosting as a Godaddysites.com subdomain. After 30-days, your website is deleted if you don’t upgrade. GoCentral is a reliable website builder for beginners who want an easy-to-use builder with a wide variety of design tools. This builder is suitable for anything, from personal blogs all the way to e-commerce stores. The primary advantage of using this builder over others is that all tools you need to create your website are available in one spot, including e-commerce tools. There’s no need to add additional apps or plug-ins to achieve the main functionality of your website. However, the builder is very limited in terms of templates and some design elements. While you can edit your website dynamically, the elements are restricted to a block style, making your website look a bit simplistic. That said, this builder is perfect for those looking for a mobile-friendly website that doesn’t require extra coding or separate webpages. As such, you can even edit your website directly from your mobile, a feature that many website builders don’t offer. Despite some of the design limitations, GoCentral is definitely a product that beginners should check out. Keep in mind that you can get a 30-day free trial without a credit card. That way, you can try it risk-free and find out why so many go with GoDaddy GoCentral to create their website. Wondering how GoDaddy Website Builder stacks up against other Website Builders? Enter any other Website Builder and we will give you a side-by-side comparison.